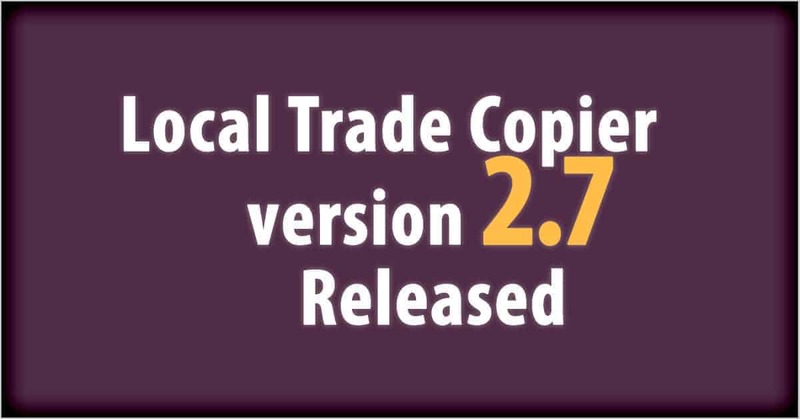 Local Trade Copier v2.7 for MT4 is released! What’s new in LTC v2.7? LTC is slowly moving to a better GUI (graphic user interface) where you will be able to control the app directly from the chart window. I must admit that I am busy like never working like crazy and doing my best I can on several projects like Autotrading Academy and Signal Magician, but Local Trade Copier is one of my most popular software and I have big plans for this baby. In the latest version of LTC I introduce you to a couple of new options, but they are added directly on the chart window, to be specific on the right side. Usually all settings are accessible from the “EA Inputs” tab in the “EA Properties” window, but these two are accessible right from the chart. This is very convenient, isn’t it? 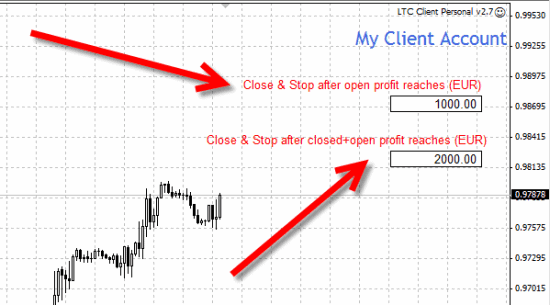 1) Close & Stop feature – Easy profit taking for day traders. In the picture below we see two “Close & Stop” settings which allow you to set the Client EA to close all open positions, delete all pending orders and stop itself completely. This happens when a specific profit target is reached. 1st option allows you to “Close & Stop” after profit of all open positions reaches certain amount of money in deposit currency. 2nd option allows you to “Close & Stop” after profit of all closed + open positions reaches certain amount of money in deposit currency. Click here for more information on how “Close & Stop” profit taking feature works. 2. Multiple Trade Comments for filtering. Position filtering just got better after I’ve improved the ExcludeTradeComment and FilterTradeComment features. Now you are allowed to enter multiple trade comments into these fields. They need to be separated by comma, but I’ve also added this new feature called TradeCommentDelimiter, which allows you to set custom delimiter. 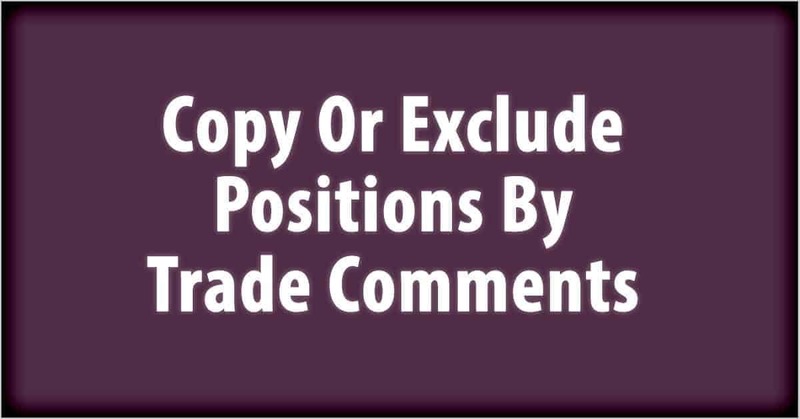 Read more about filtering or excluding positions by trade comments. 3. Copying of current master positions just got easier. I’ve added new option called CopyOpenPositions, which tells the Client EA to copy all currently open positions on the master account. This is specifically for copying currently active market orders. Previously you could copy old trades too, but it was quite confusing for many as it required to set the IgnoreTradesBeforeTimeStamp value correctly. Now, even if this value is left empty, but CopyOpenPositions is set to true, the Client EA will copy all currently open master positions. You can still control how old those trades should be and note that MaxPriceDeviation and any trade filters will be applied, so you might not see all the trades copied. Read this article on how to copy currently open master positions. Previously Client EA has been using master account equity and client account equity to calculate position size (trade lot size). This created a lot of confusion, and also unwanted or unexpected position sizes. I’ve decided to set the Client EA use account balances of both, master and client account, for position size calculation. This means now the Local Trade Copier will calculate position lot size based on the master account balance and client account balance. RiskRatioServerUseServerBalance. If true, the Client EA will use server account balance. If false, Client EA will use server account equity. RiskRatioServerUseClientBalance. If true, the Client EA will use client account balance. If false, Client EA will use client account equity. There was quite a big problem when client account tried to copy a position for some symbol/instrument that was actually hidden from its “Market Watch” window. If some currency pair or symbol is hidden from the “Market Watch” then it is impossible for any EA to open position for that symbol. Now, thanks to recent MT4 updates, it is now possible for EA to enable symbols programmatically. This means my trade copier will try to enable symbol in the Market Watch (if it’s missing) before copying a trade. If such symbol is missing then there will be no other choice for the Client EA than to ignore the trade. But if the symbol was simply hidden, the Client EA will enable it and copy the trade. I hope this will remove many of the issues people faced when their positions were not copied, because some symbols are not enabled on the client account. Obviously, it is always easy to set the “Show All” in the “Market Watch” and avoid this problem. But many Forex brokers have dozens if not hundreds of instruments available on that list and this only uses additionally Internet bandwidth and creates unnecessary load on the VPS server processor. Well, this is embarrassing, but there were few lines in the code that sometimes caused the EA to crash because of the “zero divide” error. In most cases people faced this error when they were running EA on an empty MT4 account, with no money. Account balance is used in many formulas in the copier code and when it was zero it caused the “zero divide” error. Also, in some cases the AcceptTradeCloseSignals did not work and Client EA still were closing the trades. Now this is fixed. I hope you will find these improvements useful. If you do not have a Local Trade Copier software yet, it is the best time to buy it. i need this software.could you please response to my email?